Nutritionist, health consultant and award-winning author Nancy Addison shares 35 superfoods for healthier bodies and minds. She recommends eating purple foods like Wild Blueberries to help reduce stress, make you sleep better and even fight depression naturally. In a controlled double-blind study, Wild Blueberries were shown to help prevent low mood and depression. Registered Dietitian, Liz Shaw, declares Wild Blueberries one of the top anti-inflammatory fruits on the market today. 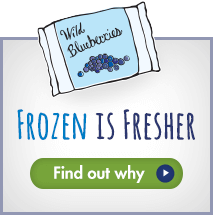 She explains Wild Blueberries are so powerful because they combat stress in the wild by producing phytochemicals and anthocyanins to protect themselves and it’s these naturally occurring compounds that help protect consumers from inflammation and chronic disease – one berry at a time. Toby Amidor, a registered dietitian and nutrition expert, shares 10 protein- packed recipes to help celebrate Father’s Day. She includes our delicious Shrimp and Veggie Kabobs with Wild Blueberry Barbecue Sauce and notes that shrimp are bursting with power protein and omega-3s to help the heart, and the Wild Blueberry BBQ sauce is full of health-helping antioxidants.